Miniature instruments could help the European Union determine whether nations are meeting pledges to cut greenhouse-gas emissions. European researchers are developing a miniaturized instrument that could precisely measure carbon dioxide coming from cities and power plants. If it works, the device could fly aboard a constellation of small satellites starting in the late 2020s, helping to track daily fluctuations in greenhouse-gas emissions. Developers with the three-year, €3-million (US$3.5-million) project envision it complementing more expansive efforts to monitor CO2 from space, such as a proposed set of new Sentinel Earth-observing satellites from the European Space Agency. If approved, those might also come online in the late 2020s. Several satellites currently monitor CO2 emissions, including Japan’s GOSAT, the United States’ Orbiting Carbon Observatory-2 (OCO-2), and China’s TanSat. But none of them launched with the explicit goal of tracking compliance with global treaties. In 2015, before the signing of the Paris accord to limit greenhouse-gas emissions, the European Commission began exploring how it could develop satellites to assess whether nations are abiding by their climate pledges. The new small sensor could play a part in that. “We want to improve the accuracy of monitoring anthropogenic CO2 emissions,” says Laure Brooker Lizon-Tati, an engineer with Airbus Defence and Space in Toulouse, France. She coordinates the project, called the Space Carbon Observatory (SCARBO), which is being developed by a consortium of eight European companies and research institutions. Team scientists will describe first results at a space-optics conference in Chania, Greece, on 10 and 11 October. 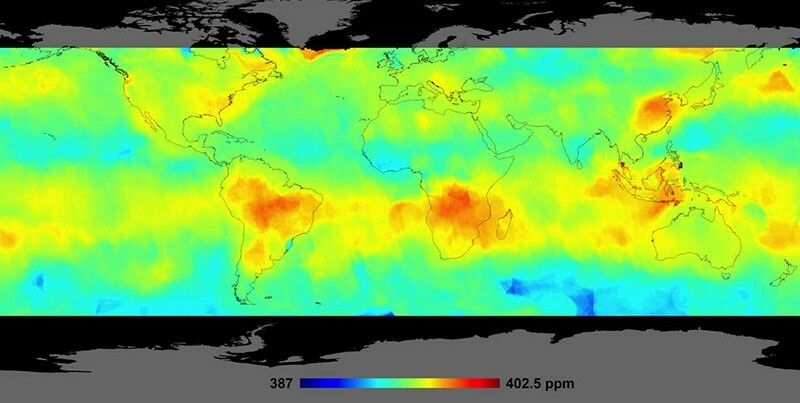 The proposed Sentinel satellites would precisely measure greenhouse gases around the world. But they would not be able to make daily measurements above places of interest, such as cities. “This is where a constellation of tiny SCARBO systems could come into the game,” says Heinrich Bovensmann, a remote-sensing researcher at the University of Bremen in Germany. SCARBO satellites would weigh just 50 kilograms each, roughly one-tenth the mass of OCO-2 or TanSat. An estimated two dozen working together would be able to cover the globe once a week, but could fly over particular areas of interest once a day. Together they could monitor frequent changes in carbon emissions, such as morning and afternoon surges from an industrial area. But first, SCARBO scientists have to show that their plan can work. At its heart is a miniaturized spectrometer — no longer than an outstretched hand — that would detect CO2 concentrations in the air below. Fitting a spectrometer onto a small satellite requires shrinking optics and developing new methods for analysing carbon dioxide concentrations. “It’s a real challenge,” says Bovensmann. The scientists’ goal is to measure CO2 concentrations to an accuracy of less than 1 part per million at a resolution of 2 kilometres — comparable to the data collected by larger satellites now in orbit. “We want to prove the technology can achieve these types of measurements,” says Etienne Le Coarer of the University Grenoble-Alpes in Grenoble, France, which is building the instrument along with the ONERA French aerospace laboratory in Palaiseau. NASA’s Jet Propulsion Laboratory in Pasadena, California, has worked on a similar concept for miniaturized sensors, but using a different type of spectrometer. SCARBO scientists plan to test their instrument aboard a research aeroplane in 2020. It will fly alongside a Dutch-built instrument to study atmospheric aerosols, which are a major source of error when trying to measure greenhouse gases. The test will be the first time that aerosols and carbon dioxide are measured simultaneously to improve the quality of data on greenhouse-gas emissions, says Lizon-Tati. SCARBO is focusing on CO2 monitoring, although it would also be useful for tracking methane emissions, says Le Coarer. Several private efforts to monitor methane emissions cheaply from space are already under way, including a Canadian microsatellite that has been flying since 2016 and a planned small satellite from the Environmental Defense Fund, an advocacy group in New York City.